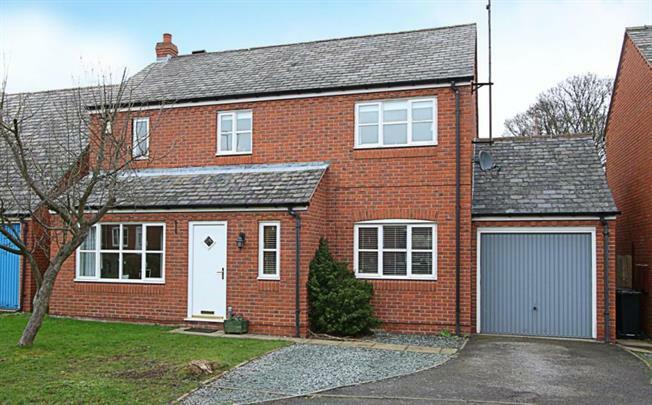 4 Bedroom Detached House For Sale in Sheffield for £235,000. Only upon internal inspection can this superb double fronted four bedroom detached family home be fully appreciated. Occupying a sought after cul-de-sac position this charming property won't fail to impress. Boasting contemporary decor throughout, newly fitted carpets to the first floor, gas central heating and double glazing we strongly urge an early viewing so not to miss out on this delightful property. Newly refurbished by the current owners and finished to a high specification, having reconfigured and replaced the fitted dining kitchen with integrated appliances, newly fitted contemporary en suite shower room and replaced gas central heating boiler. In brief the accommodation comprises: to the ground floor the hallway having tiled floor that leads through to the kitchen and stairs rising to the first floor landing, access to a ground floor wc, and that also gives access to the generous dual aspect living room with French style doors accessing the rear garden. A superb effectively extended open plan dining/kitchen is open plan from the hallway, being fitted with an attractive range of wall and base units with appliances to include five ring gas hob, electric double oven, extractor fan, space and plumbing for a dishwasher and fridge/freezer and a door into the utility room. The utility room provides space and plumbing for an automatic washing machine and tumble dryer and a rear entrance door provides access to the garden. To the first floor, the master bedroom with built in double wardrobes, attractive en-suite shower room fitted with a wash hand basin, low flush wc and shower enclosure with mains shower within, tiling to splash backs and floor, along with a ladder towel radiator and shaver point. Three further generous bedrooms and the family bathroom fitted with a three piece suite in white..
Externally: The property stands in charming well maintained gardens both front and rear, the rear being landscaped with a flagged patio area and the drive providing off road parking for two vehicles gives access to the single garage.